Come and enjoy this one bedroom, one bath condo at Ventana Vista. The quiet, private patio is just waiting for you! You will love the upgraded kitchen and tile flooring throughout the kitchen, living room and bathroom. The bedroom has carpeting and a queen bed for your comfort. 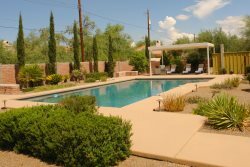 Located in the gated Ventana Vista Community, less than one mile south of Sabino Canyon, in the northeast part of Tucson. This wonderful, down stairs condo is typically available for monthly stays. However, call our office to inquire about weekly availability during certain seasons.